Arizona Geology: Can Arizona potash be developed as part of "world's hottest mining story"? Can Arizona potash be developed as part of "world's hottest mining story"? The spot price of potash has risen from around $50 per ton to over $500 per ton in the last few years. Some Canadian and U.S. producers are raising prices for Southeast Asia and Brazil to $725-750 on June 1. Spot prices for those markets are $1,000 for July. These dramatic increases are blamed on rising demand for fertilizers, limited production expansion, and constraints at some mines, according to a report at Mineinfo.com which called it the "world's hottest mining story." 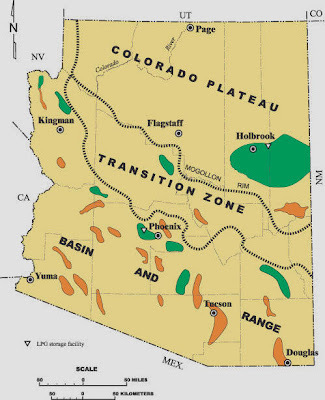 Arizona has substantial potash deposits in the Holbrook basin [large green area in east central Arizona, right] which now may look a lot more economically attractive. "The potash in the Holbrook basin underlies about 600 square miles and ranges up to 38 feet thick. The potash in the Holbrook Basin minerals include sylvite, carnallite, and polyhalite. There has been no solution mining or commercial production of potash even though exploration drilling in the 1960s and 1970s indicated a potential of as much as 285 million tons of nearly 20 percent average grade K2O." That tonnage estimate is from a 1966 ARKLA Exploration internal report that identified it underlying about a 30 square mile (19,000 acres) area. They report that 92% of the company's 54,400 exploration acreage block was apparently untested. "Tucson, the Phoenix has landed!"